The PetSafe Electronic SmartDoor™ comes with one SmartKey, which unlocks the door and lets only your pet inside or out. If you have more than one pet, give each one a transmitter so all pets have access. Overview: The PetSafe SmartKey is an accessory designed for use with the PetSafe Electronic SmartDoor (large or small). The SmartDoor operates via radio frequencies (RF) and will unlock when it detects the radio signal from your pet's SmartKey, allowing your pet access through the door. When the SmartDoor no longer detects the SmartKey, the door will automatically lock back into place. The SmartKey has a loop that allows it to be easily attached to the dog's collar. 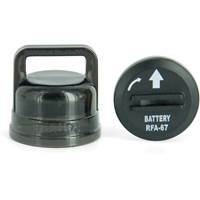 Power Requirements: The SmartKey uses a proprietary RFA-67 battery designed by PetSafe. The RFA-67 is easily replaceable, and has a typical life of approximately 6 months. 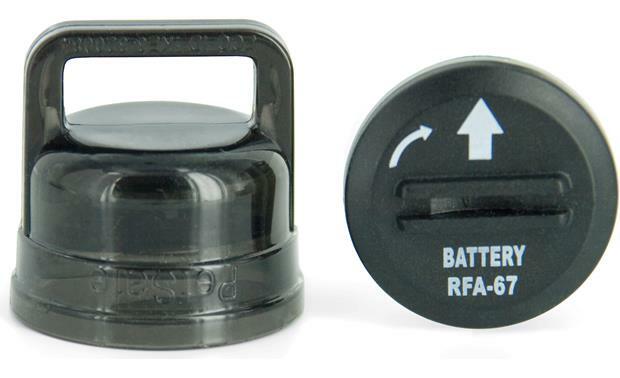 The battery simply twists into the bottom of the SmartKey, and features on and off positions. SmartKey Operation: The SmartKey emits radio signals over an area up to approximately 2.5 feet. When your pet gets near the SmartDoor, the door should unlock automatically. Once the pet has left the door's active area, the door should automatically lock after a short period of time (up to 15 seconds). The SmartDoor's sensitivity can be adjusted via a rotary control. The SmartDoor can be programmed to allow some dogs access while wearing the SmartKey, while rejecting access to other dogs with SmartKeys. Each dog in your household that you want to give access to the SmartDoor should have their own SmartKey.